Hunter fell to 3-2 on the season after allowing the winning run in the eighth inning of Tuesday's loss to the Red Sox. He threw one inning, giving up a run on two hits, including one homer, while striking out one. Hunter was called upon to keep the game tied in the eighth inning, facing Boston's eighth, ninth and leadoff hitters. In the end, it was the No. 9 slot that did the damage, with Brock Holt smacking a pinch-hit homer. 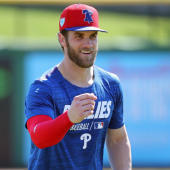 Hunter hasn't been terrible by any means this season, but he hasn't been what the Phillies hoped for when they signed him to a two-year, $18 million contract in December. He's been used in the third-highest leverage situations among Phillies relievers this year, but his mediocre 4.00 ERA is fifth-best in the Phillies' bullpen, leaving him poorly positioned to move into a more significant role.